A few years ago I wrote about two artists who played with the question of whether what they are depicting is anything more or less than words on a page or paint on a surface. 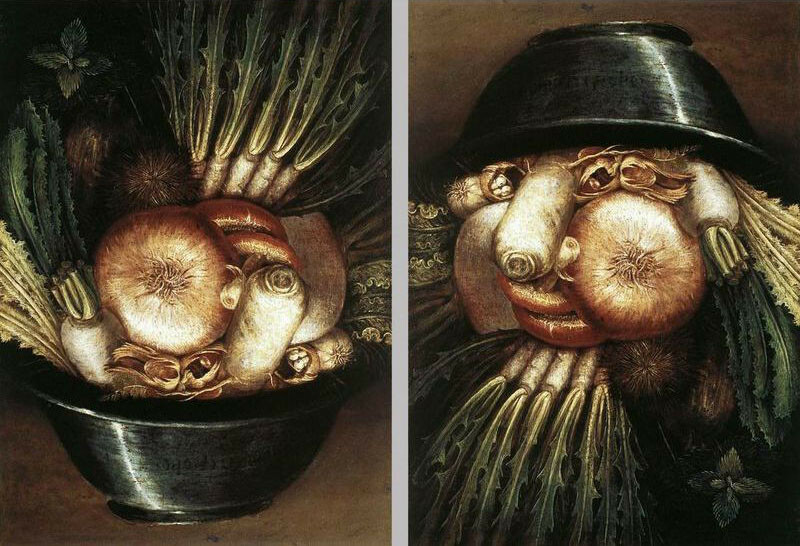 Both the poet George Herbert and the painter Arcimboldo make art of the question, What is art? Is it what it depicts, an idea about what it depicts, both at the same time (which makes it a third option), or something less than? Is art, by definition, always a misfire, in that a depiction of a thing is not the thing and never can be? One word, even a single syllable, too many or one word mislaid or deleted, and there is no altar there. No “Altar.” It is an altar made of words but no less central to the life of a church than an altar made of stone. 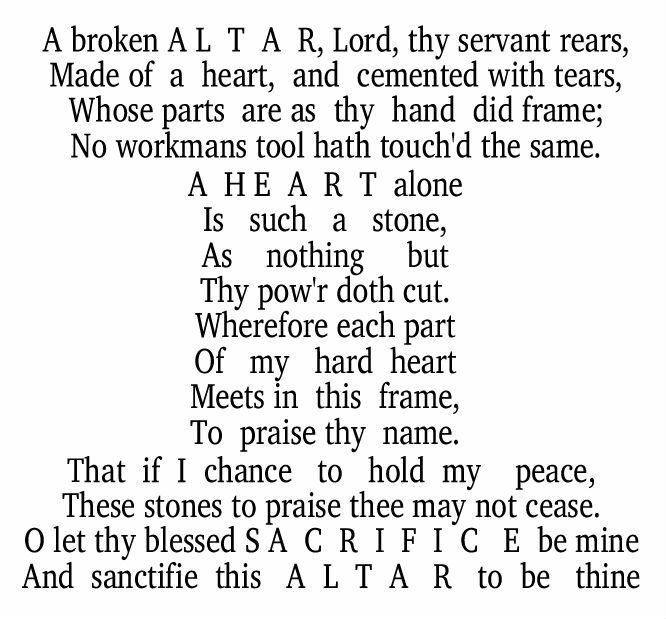 The human heart (the “HEART alone”) is the only perfect, unbroken, stone for worship, is the only true altar. All that his mind can make is something out of these pieces of meaning, words, and if he can get out of his own way (“if I chance to hold my peace”), these words as assembled here only exist to worship and love. They are what they are, words, and the words each on their own are not an altar, and a spoken version of this poem is not an altar, either. When is an altar an altar? At what point is a poem something other than, more than, words on a page? However well-constructed it may be—it looks like an altar, for crying out loud—it does not matter. It is no altar. Not even a photorealistic painting of an altar would be an altar. Further, no altar is truly an ALTAR, as no earthly object is made of the only stone of faith that exists: the human heart “cut” by God. So if poetry is always at best an approximation of True Love, why not try to sing this struggle, as well? The “cheerfully agnostic” (which pretty closely describes me, as well) English composer Ralph Vaughan Williams created five songs out of four Herbert poems a little over a century ago. The suite is called Five Mystical Songs, and one, “Love Bade Me Welcome,” is a setting of “Love (iii).” Some churches use the last song, “Antiphon,” as a hymn sung by the congregation. This first appeared two years ago.